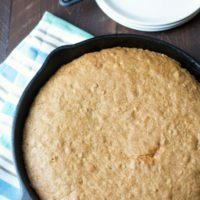 This gluten free cast iron skillet oatmeal pizookie cookie is a moist and delicious giant cookie that can be enjoyed anytime. 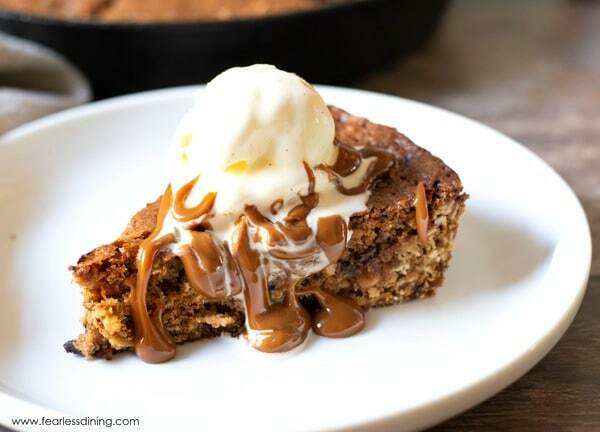 Top this delicious skillet cookie with vanilla ice cream, then slather it with caramel dolce leche sauce. It is so hard to resist!! Today is all about big cookies. Some call these big cookies “pizookies” because they resemble a pizza. Anyway you call it, my kids go crazy over this gluten free pizookie recipe! The bigger the better!! 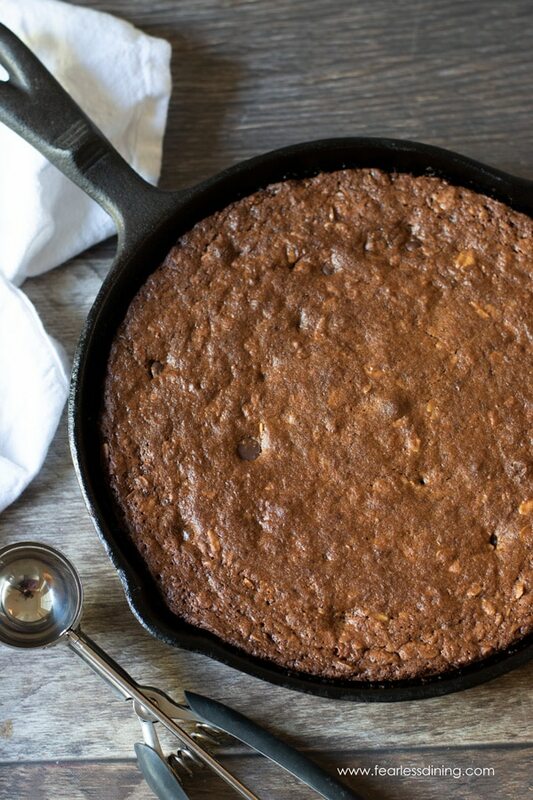 Just look at this Gluten Free Pumpkin Skillet Cookie. 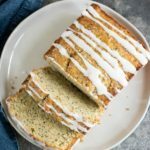 I have been experimenting with baking in my cast iron skillet lately. I love how easy it is to bake with this skillet. It retains heat beautifully, making your baking turn out even. I had a cast iron skillet for a long time that sat neglected under my stove for years. I finally learned how to clean my skillet properly so I could make better use of it :-). 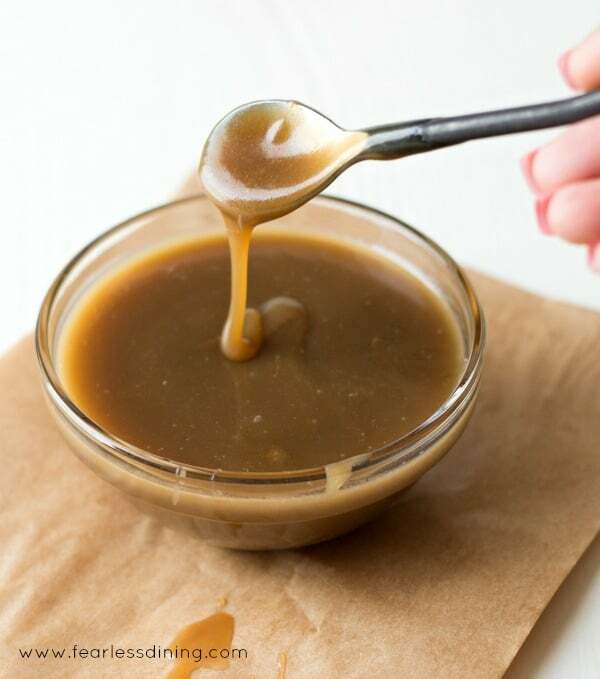 You will love how easy this bourbon butterscotch sauce is to make! 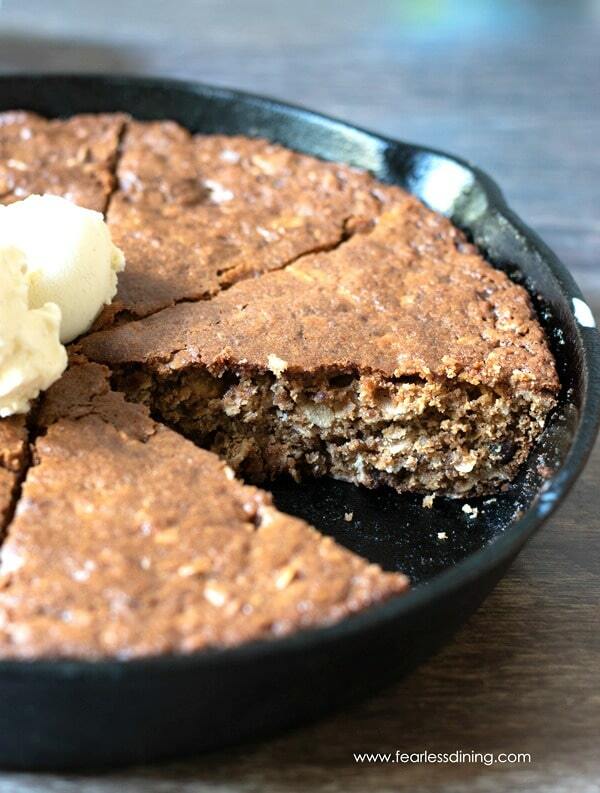 This gluten free skillet cookie is so easy to make. 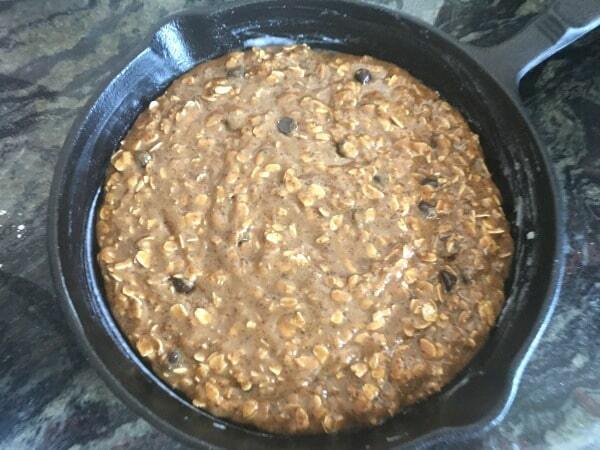 All you need are a few simple ingredients like certified gluten free oats, brown sugar, butter, gluten free flour, chocolate chips or raisins, an egg, vanilla, and cinnamon. 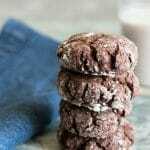 Can you use this oatmeal cookie batter to make regular sized cookies? Of course!! You can also make regular sized cookies out of this cookie dough if you don’t have a cast iron skillet. I can’t stress enough how important it is to use certified gluten free oats. Regular oats are very easily cross-contaminated with gluten every step of the way from growing in the fields, to harvesting equipment, to silo storage. There are many brands of certified gluten free oats, even Trader Joe’s has them! 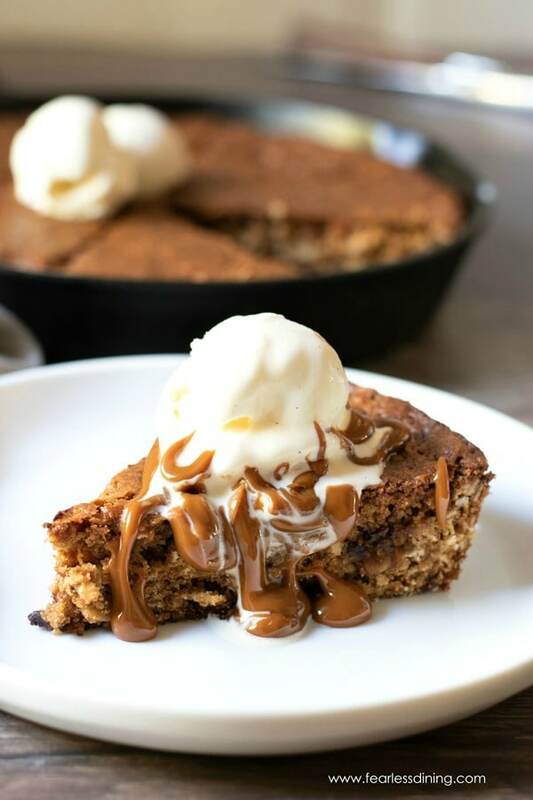 Are you ready to make this gluten free pizookie recipe for yourself? 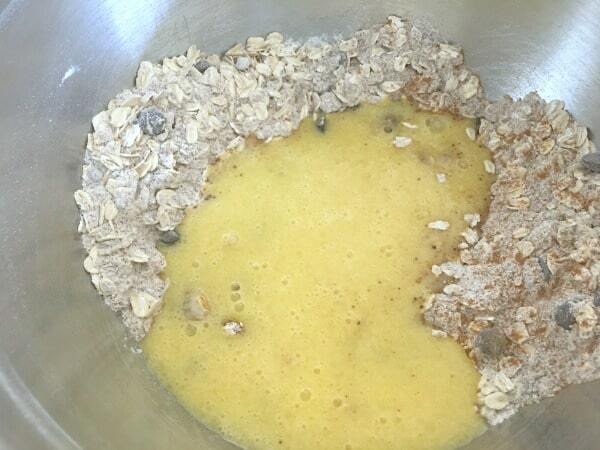 The first step to making a gluten free oatmeal skillet cookie is to add all dry ingredients to a bowl. 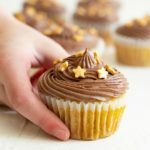 Use a whisk to blend thoroughly. In a separate bowl, add all of the wet ingredients and whisk to blend. How long do you bake a pizookie for? Pour the cookie dough into a greased cast iron skillet. Spread it out and bake the skillet cookie for 18-20 minutes at 350F degrees. Slice the gluten free pizookie and enjoy warm :-). 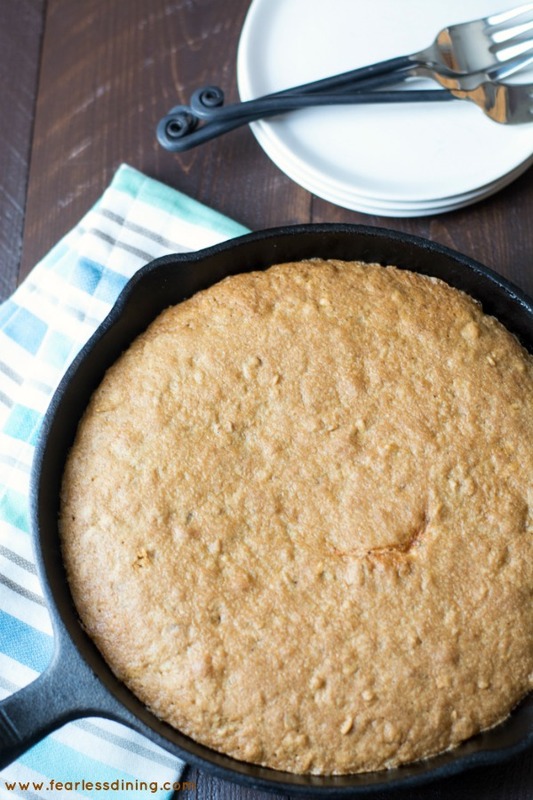 You can see the inside and how moist this giant gluten free skillet cookie is. This delicious bourbon butterscotch sauce also tastes amazing on this Gluten Free Blond Brownie too! A cast iron skillet, I used a 10 1/2 inch skillet. Certified Gluten Free Oats. 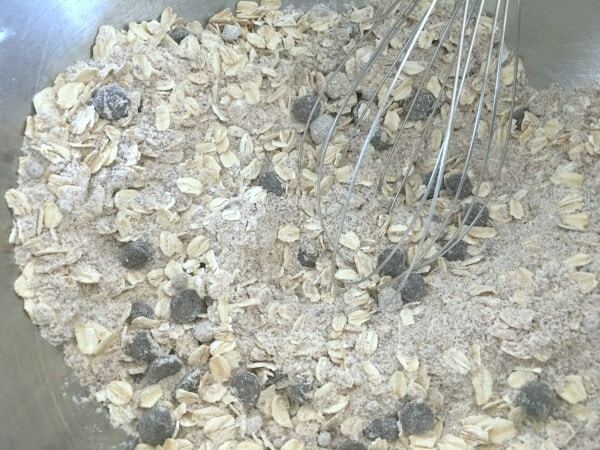 This is so important as non-certified oats are almost always cross-contaminated with gluten. In a mixer, add wet ingredients and mix on low. Top with ice cream and bourbon butterscotch sauce. Oh my goodness! Ooey gooey giant cookie goodness, WOW!!! I didn’t think bourbon was gluten free, is there a specific brand you use to make the sauce? that bourbon butterscotch sauce looks dreamy. I love your recipe!! I am obsessed with butterscotch sauce… Looks delicious!! Oatmeal cookies are one of my favorites! And I love the fun of a skillet cookie! That sauce looks to-die-for! 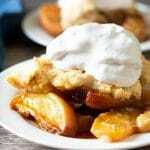 And I can’t wait to make this whole dessert! yum! I’ll take everything in the skillet AND the bottle!! Oh my goodness this looks amazing. I’m a huge fan of oatmeal and skillet dishes. Love the gooey caramel photo! WOW! 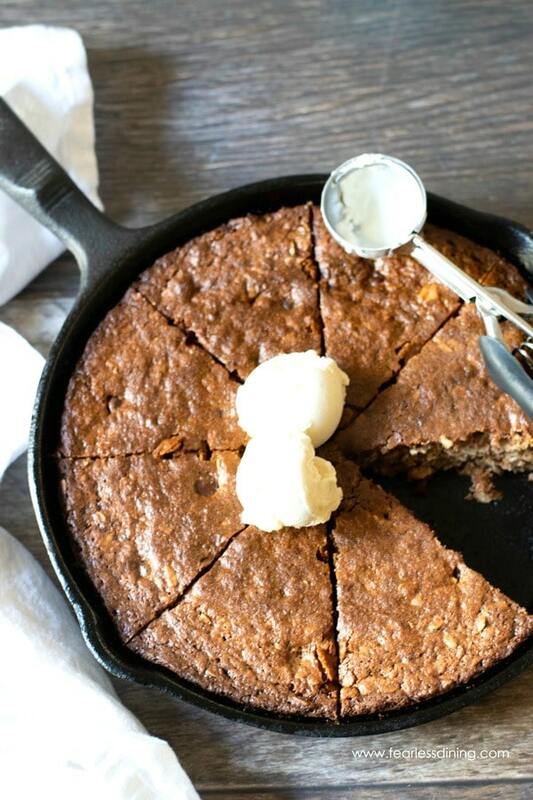 This skillet cookie sure looks mouthwatering! I am pinning it for later! 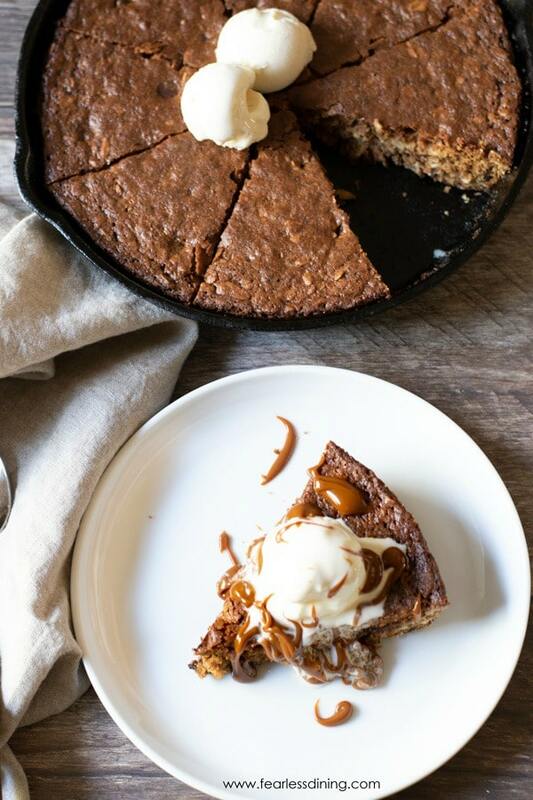 As if the cast iron skillet cookie wasn’t enough….the butterscotch sauce sounds fantastic. What an awesome combination! !